While Interior Secretary Bruce Babbitt considers greater protection for Oregon's Steens Mountain, local ranchers and environmentalists argue over whether the land should become a cow-free national monument or a conservation area that would allow grazing. Is the Grand Staircase-Escalante a model monument? Superintendent Jerry Meredith has a management plan for Utah's new Grand Staircase-Escalante Nat'l Monument, the first park to be managed by BLM rather than Park Service, and many environmentalists and some locals praise the job he's doing. In his own words, environmentalist lawyer Andy Kerr argues for an end to grazing on Steens Mountain. In her own words, Sierra Club volunteer Jill Workman says that grazing need not be banned on Steens Mountain. In his own words, Bill Marlett of the Oregon Natural Desert Association says that Steens Mountain needs all the protection it can get. In his own words, rancher Fred Otley defends ranchers' stewardship on Steens Mountain. 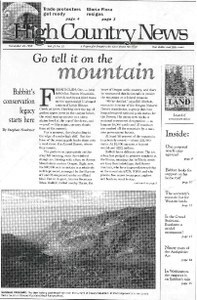 In his own words, ranch manager Stacy Davies says that multiple use is best for Steens Mountain. Interior Secretary Bruce Babbitt has his eye on a half-dozen other BLM territories in the West that he is considering for greater protection before he leaves office. A time line gives high points in the history of the Antiquities Act, which since 1906 has been used to designate many national parks and monuments. In Washington, D.C., Interior Secretary Bruce Babbitt battles Western Republicans over the use of the 1906 Antiquities Act to preserve Western land for the public. A new report, "Air Quality Concerns Related to Snowmobile Usage," says snowmobiles produce nearly all the air pollution in Yellowstone National Park. The Conservation Technology Support Program is offering Geographic Information Systems grants to environmental groups. A report by Public Employees for Environmental Responsibility titled "Attacks on Federal Employees" documents a rising tide of violence against Forest Service and BLM staffers. Helen Carlson's book, "Nevada Place Names," is a delightful dictionary that untangles the stories behind the state's place names. A new report, "A Study of Management and Administration: The Bureau of Indian Affairs," gives the beleaguered BIA advice about how to get itself back on track. Nov. 12 was the grand opening of Kartchner Caverns State Park near Tucson, Ariz.
A conference on tailings and mine waste is being held Jan. 23-26 at Colorado State University. The Great Salt Lake Issues Forum will be held Feb. 25-26 by Friends of Great Salt Lake. Friends of the Wild Swan in Montana are selling a calendar with favorite cartoons of Elmer Sprunger. Cherry boom in Asia; controversy over parade shootouts in Idaho; whale radio; sewage blamed for Yosemite rock falls; hunter shoots llama; hunters, cell phones and lions; "disrobe for disarmament" in San Francisco; Wyo. Gov. Geringer defends rich. A celebration of Gudy Gaskill, who jumpstarted the building of the Colorado Trail; corrections; adventures of a paddle and its return. A land swap set up by Plum Creek Timber Co., the Forest Service and eight environmental groups will protect some of the last old growth remaining in Washington's Gifford Pinchot National Forest. A new hunters' group called the Friends of the Northern Yellowstone Elk Herd is blaming wolves for the recent drop in the population of the park's northern elk herd. Chronic wasting disease strikes elk in Mont. ; Columbia River's Hanford Reach now part of Saddle Mtn. wildlife refuge; Puget Sound bull trout listed as endangered; a bill is passed to give $3 billion for land purchases and wildlife conservation programs. As many as 50,000 protesters are expected at the World Trade Organization conference in Seattle, Wash., demanding that global trade rules must take into account environmental, labor, safety and human rights protections. Environmentalists, federal agencies and area Indian tribes are pushing to decommission 90-year-old Fossil Creek Dam and its two small hydropower plants near Strawberry, Ariz. The Federal Energy Regulatory Commission (FERC) is the little-known agency that handles hydroelectric project licensing.